Last year, Ikea surveyed8,500 people in eight cities around the world, to better understand their kitchen habits.The results of that survey are published in the company’s second annual Life at Home Report.Among the more interesting findings was the fact that 60 percent ofsurvey participants grew plants indoors, be they vegetables or flowers.Gardening was more common in Shanghai, where the number is 75 percent. Its no surprise, then, that Shanghai is where Ronnie Runesson, a senior product developer at Ikea, came up with the company’s new line of indoor gardening kits. Runesson, who is Swedish and has worked at Ikea for 33 years, recently spent three years in the companys Shanghai office. While in Shanghaihe visited with other product suppliers, and saw several small, indoor units where office workers grewtheir own lettuces and herbs. Runesson, whose parents were farmers, was intrigued. He did some market research and found similar products in Japan and China, but none for purchase in countries like Sweden or the United States. So he brought the idea to Ikea. 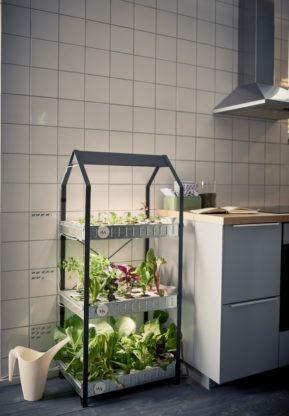 Ikea adapted the concept, and the Krydda/Vxer line of small-scale hydroponic gardening kits was born. Its available now in the UK, and will make its way stateside early next year. The Krydda/Vxer kits include a handful of parts: seeds, a frame, an LED light that mimics the sun, and two trays. The firsthouses moistened, stone wool plugs; the second, water-retaining pumice stones. Seeds implanted inthe stone wool plugs eventually sprout. After that, the seeds and plugs get repotted into new vessels, along with the pumice stones. Users water the plants evenly with asmallirrigation system. Seven months later, the newly grown herbs, lettuce, bok choy, and chard—Ikeas initial offering—can go directly from planter to plate. Runesson wanted the system to be as simple as possible. He also wanted to ensure that people around the world could grow plants successfully at any time of year.He and his team consulted with scientists at the Swedish University of Agricultural Sciences to create a universally viable growing kit, which, in this case, means a starter pack of 12 seeds and some appropriate fertilizer. The LED lighting, too, needed to work for all kinds of climates, kitchen sizes, and sun exposure. Ikea is paying special attention to the ideathat, in the future, peoplewill have to adapt to living in smaller apartments in urban environments. To explore that idea, last year Ikea partnered with Ideo to create a concept kitchen for the year 2025. The prototypes for near-future living included a smart table that uses augmented reality to assist cooking, inductive cooling containers, and a composting system that siphons off nutrients from waste to feed indoor plants. The Krydda/Vxer kits arent that high-tech, but they are a stepin the direction ofsustainable city living. Besides, its only 2016. Weve still got nine years to get to that AR kitchen table.